The recent re-issue by EL Records of the 'Missa Luba' album by Les Troubadours du Roi Baudouin brings into the spotlight once more one of the strangest paths to international recording success ever taken by an artist, Christian or non-Christian. If by any chance you are a movie buff, you will be familiar with the 'Missa Luba' album because of its extensive use in the 1968 hit movie If. . . while pop chart anoraks may be able to tell you that two of the songs on the album, "Sanctus" and "Benedictus", spent 11 weeks on the UK charts reaching number 28 in March 1969. The Missa Luba is a setting of the Roman Catholic Latin Mass sung by an aggregation from the Democratic Republic of Congo. Its originator was Belgian priest Father Guido Haazen OFM (Order of Friars Minor). He became director of Kamina Central School in 1953 in what was then the Belgian Congo. The singing group was part of the Baluba tribe which spread through south central Africa. A few weeks before Christmas, Haazen formed a singing group of about 50 schoolboys, ages nine to 14, to prepare some traditional songs for the approaching holiday. The choir was well received and the boys continued to perform together for special occasions. With the help of the Commission of the District of Kamina, Father Haazen prepared an illustrated album of the choir and forwarded it to King Baudouin of Belgium in 1955. About a year later Father Haazen received an official notice from the Royal Court of Belgium, authorising him to use Les Troubadours du Baudouin as an honorary title for his choir. Sometime between 1956 and 1958 the President of the Catholic Missions Pavilion for the 1958 Brussels World's Fair, Mgr S J Guffens, visited Kamina and requested an audition of the Troubadours. The audition resulted in an invitation to perform in Belgium. 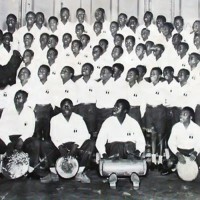 In 1957 Haazen and the Baluba people of Kasai and Katanga began developing the Missa Luba from collective improvisations on traditional song forms. It was first performed at the Catholic mission of St Bavo in Kamina on 23rd March 1958. The next day, the ensemble left for a tour of Europe, performing the Mass and Congolese folk music in Belgium (where they gave concerts at the World's Fair in Brussels), the Netherlands and Germany (where they sang with the Vienna Boys Choir). The celebrated recording of the Missa Luba by the Troubadours and soloist Joachim Ngoi, a teacher at Kamina Central School, was made at this time. The opening of the Mass, "Kyrie", was in the style of a kasala, a Luba song of mourning. "Gloria" was improvised in the Kiluba style characteristic of Katanga. "Credo", the longest section of the Mass, was based on five different folk songs linked by improvisations. The text of "Credo" refers to the crucifixion of Christ and the vocal part on 'Missa Luba' was preceded by the customary announcement of death, first on the kyondo (log drum), then on the kikumvi (tom-tom). There followed a kilio (elegy) without percussion accompaniment, sung by the solo voice. "Sanctus" and "Benedictus" were inspired by a Bantu farewell song. "Hosannah" was a rhythmic dance of Kasai and "Agnus Dei" was a typical Bena Luluwa song, such as might be heard around Kananga. A 10 inch album of Missa Luba was released by Philips Records in the Netherlands and other European markets in 1958. Over the next few years the reputation of this unique world music/sacred music fusion grew and grew. In 1963 the 'Missa Luba' recordings of 1958 together with a collection of Congolese folk songs sung by Les Troubadours du Roi Baudouin appeared on the album 'Missa Luba: A Mass Sung In Pure Congolese Style And Native Songs Of The Congo'. The album was rapturously received by the critics and the following year "Gloria" from the album featured in Pier Paolo Pasolini's film The Gospel According To St Matthew. More film uses followed, including "Kyrie" in MGM's The Singing Nun in 1966 and then, most famously of all, Lindsay Anderson's 1968 counter-culture tirade If. . . starring Malcolm McDowell. Tracks from 'Missa Luba' continued to pop up in films including Lost And Delirious (2001) and Never Let Me Go (2010). Punk rock pioneers The Clash refer to the recording in the lyrics of "Car Jamming" on their 1982 album 'Combat Rock' and in an article in Mojo magazine Les Troubadours du Roi Baudouin was mentioned as one of the 10 albums that "made" the sound of Led Zeppelin. Despite the many international releases of 'Missa Luba' no single issue has brought together all the recordings of Les Troubadours du Roi Baudouin. The most complete version is 'The Original Missa Luba And Songs From The Congo' released by Universal in 1999, which contains an expanded program of 22 Congolese songs and the Missa Luba, but omits several of the previously released songs and the other three sacred pieces. The haunting, other-worldly sounds of tracks like "Kyrie", "Sanctus" and "Gloria" will no doubt go on affecting music lovers and cinema-goers for decades to come. 'Missa Luba' is without doubt a classic.